5th March 2018,Addis Ababa( Ethiopia): ILO, in close collaboration with its international training centre in Turin, Italy and IGAD organized a training to address some of the most important issues in understanding and implementing skills needs anticipation and matching. The training was to assist Member states to extend decent work opportunities to current and potential migrants within the region, as well as to contribute to regional integration, to strengthen the link between economic growth and job creation, and to enhance the social and economic integration of migrants. 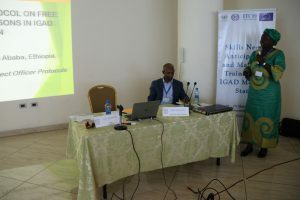 In order to support IGAD and its member states towards free movement of persons and transhumance in the region, the ILO is implementing a three years technical cooperation project titled “Free Movement of Persons and Transhumance in the IGAD Region: Improving Opportunities for Regular Labour Mobility”. The project is being implemented by the ILO in collaboration with the IGAD and its member states with the financial support of the European Union. The overall objective of the project is to improve opportunities for regulated labour mobility and decent work within the IGAD member states through the development of models of intervention, in the broader context of free movement of persons and labour mobility in the region.